Looking for a reliable and fully licensed local company to take away your Dagenham rubbish or junk? Look no further! Away With It is one of Dagenham’s leading waste removal and rubbish clearance companies. We have been providing waste removal services to businesses and residents in the RM8, RM9 and RM10 postcode areas for more than a decade. During that time we have built up a large and loyal customer base in the local area based on our reputation for fast, friendly service at competitive prices. Call us today for fast, reliable waste removal services in Dagenham! Dagenham or “Dæccanhaam” first appeared in a charter of Barking Abbey dating from 666 AD, with the name almost certainly developing from a small farmstead, or “ham”, of a man called Dæcca. In 1931, the Ford Motor Company relocated from Trafford Park in Manchester to a new plant in Dagenham. A riverside site was developed to become Europe’s largest car plant, and at its peak the Dagenham plant had 4 million square feet of floorspace and employed 40,000 people. Full production was halted in 2002 due to the prohibitive cost of upgrading the vast 60 year old site. Valence House is the only surviving of the five manor houses of Dagenham, and today is the site of the borough’s local history museum, displaying a collection of artefacts and archives documenting the lives of the people of Barking and Dagenham. Notable Dagenham residents have included musician Billy Bragg, comedian Phil Jupitus and “The Forces Sweetheart” Dame Vera Lynn. Alf Ramsey, who guided England to victory in the 1966 World Cup, was also born in Dagenham, as was future England manager Terry Venables. Sandie Shaw, winner of of the 1967 Eurovision Song Contest, was born and brought up in the area, even working in the nearby Ford plant for a time. http://www.lbbd.gov.uk/Pages/Home.aspx – Website for Barking and Dagenham local council. http://www.lbbd.gov.uk/Environment/RecyclingandRefuse/Pages/Reuseandrecyclingcentre.aspx – Your local tip and recycling centre. 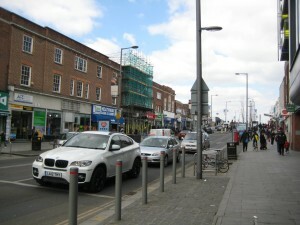 http://www.barkinganddagenhampost.co.uk/home – Local newspaper, covering news and current affairs in Barking, Dagenham and the surrounding area. http://www.joncruddas.org.uk/ – Your local member of parliament.